L’associazione partner francese, Solidarités Jeunesses, cerca volontari/e da coinvolgere in progetti di lungo termine con 2 diversi programmi: Servizio Volontario Europeo e Servizio Civile Francese. The volunteers are part of the permanent team who runs the project throughout the year. They are involved transversely in all the actions that are carried out by the association. They are in charge, in teams or individually, to prepare and organise several activities. They have responsibilities in the daily management of the hosting centre. They carry an international added value in the actions that we organise with the local population. They contribute to social and cultural learning of people with difficulties who are at the core of our actions. renovation activities in the hosting centre of the association (along with the other people we host), or in the neighbouring villages. 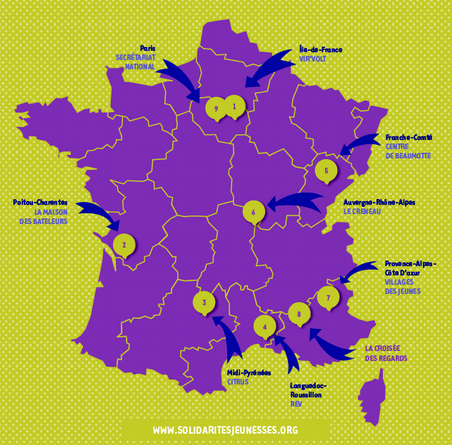 The organization of Vir’volt, Solidarités Jeunesses Ile de France is the local branch of a national movement: Solidarités Jeunesses. It has the same values as the national movement. Beside the aims of peace that are expressed by our international and national movement, there is a strong will to commit ourselves to local development. The organisation of international workcamps (short and long term), organising projects of general interest in or around the hosting centre. The organisations hosts different groups, (schools, social centres, but also free leisure time groups…) . The organisation of trainings, seminars and different activities which support the learning process of the participants. We send volunteers abroad, on international workcamps, medium and long term voluntary service, or trainings and seminars. The organisation and participation in activities regarding social, economical and professional inclusion. The organization of activities for young people with fewer opportunities, including preparations and sending volunteering in France and abroad. projects. A lot of the organised activities take place at La Maison des Bateleurs but some are also organised in Montendre, in the neighbouring towns or with others associations. The rhythm of a month includes technical trainings on renovation projects (masonry, carpentry, woodwork…) or on educational projects about sustainable development (organic garden, green building, etc.). The participation in or the development of various activities such as French courses, artistic, musical workshops according to the propositions and the competences of each of the inhabitant of the hosting centre and of people who intervenes in it. They help with the management of the centre, orientate and inform the newcomers, lead some activities and facilitate interactions and cultural exchanges between the very different people who come at le Faï. Organise debates amongst the volunteers, projections, intercultural presentations, international meals with the local community etc. The volunteer participates in the different activities of the association, being a member of a group of 6 to 8 young European and other volunteers. Citrus welcomes long term, medium term and short-term international volunteers from European and International Voluntary Service.We also cater for teenagers and young adults in individual or group stays.In the context of the fight against exclusion, Citrus organizes projects called ‘insertion’ for people in social and / or professional difficulties. All our activities are in direct contact with the local population, in a spirit of sharing and exchange. In summer, Citrus hosts groups of international volunteers (about 15 people) who will participate in restoration works (walls, paths …) for 3 weeks. We work for the general interest of a local authority or a municipality. A large garden located on the site of the “Mayounelle” is grown by volunteers. This is both an educational tool to the environment but also a resource for organic vegetables for a healthy diet volunteers. Gardening workshops are held regularly with the children of the recreation centre and the villagers. Promotion of volunteering To promote volunteering and international projects to a wider audience, Citrus holds regular stalls in academic forums, fairs’ summer jobs etc … You’ll surely have an opportunity to participate and make you want to go on workcamps with other young people, throughout your experience! cooking the meals, washing up, housework …) but also to discover new activities with concrete learning objectives – for example, in manual, technical and linguistic apprenticeship. which can be used in workshops where people can express themselves verbally, corporally and/or artistically. amount of autonomy and active citizenship. Per candidarti invia CV+lettera motivazionale a ltv@solidaritesjeunesses.org e volo@lunaria.org specificando il progetto per cui ti candidi. Per i progetti che inizieranno a Febbraio sarà possibile candidarsi entro il 12 Gennaio 2019, per i progetti di Settembre entro Luglio 2019.